The 2012 Sydney Scooter Expo. Who's at the Expo? Activities, food and test rides, it's all happening and here. 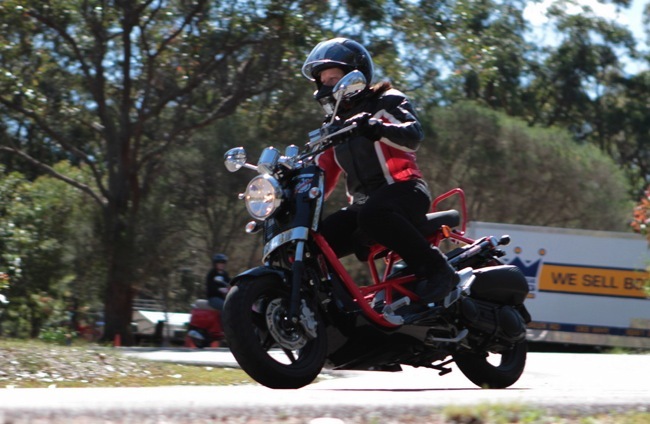 Australia's largest scooter expo is on again thanks to Honda Australia Roadcraft Training (HART) and ScooterSales.com.au. Celebrating the growing trend for scooter use in Australia, the 2012 Sydney Scooter Expo offers riders and potential riders an inside look into all things scooter related. 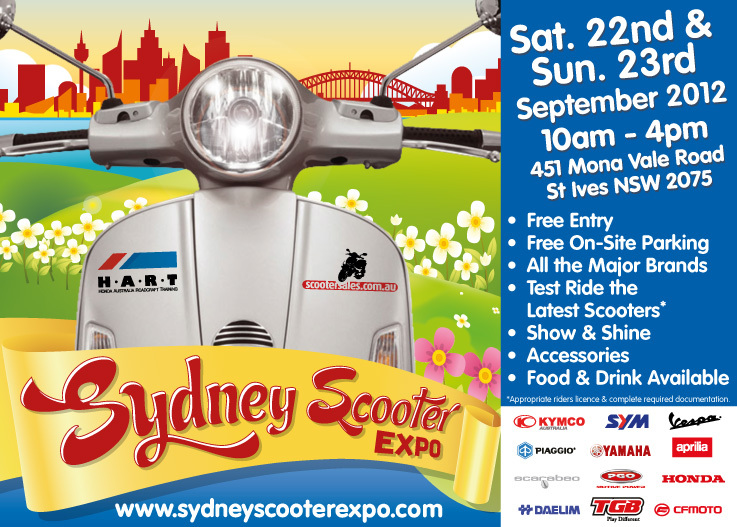 After the popularity of the 2011 event, the 2012 Sydney Scooter Expo will be held over two days, September 22 - 23, at HART's St Ives location, just north of Sydney. 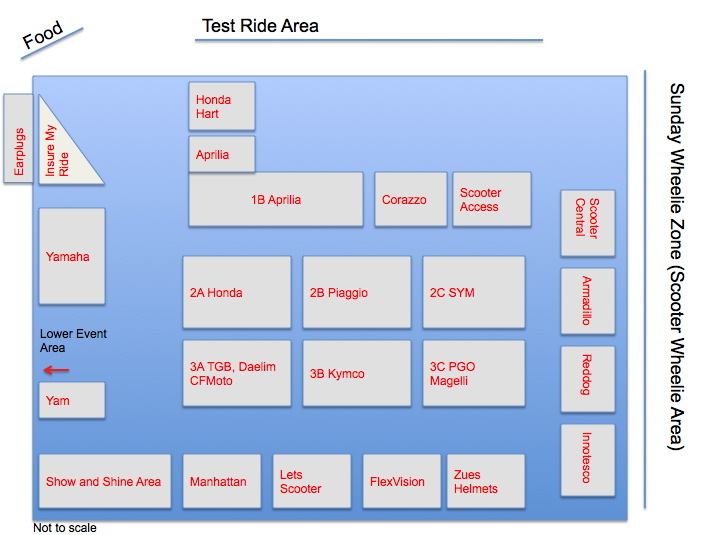 Register to book your test ride over the expo weekend. Below you will find a listing of all the models available from each of the manufacturers attending. You can walk up on the day and register if needed. Please use this listings below as a reference guide. Follow the link to your preferred day. You will be sent confirmation of your acceptance 7 days out from the event. It won't be long and we'll soon be basking in the sunshine. Spring will have sprung and summer won't be too far behind. Time to dust off the helmet and get ready to ride. The Sydney Scooter Expo is returning for its 2nd year. 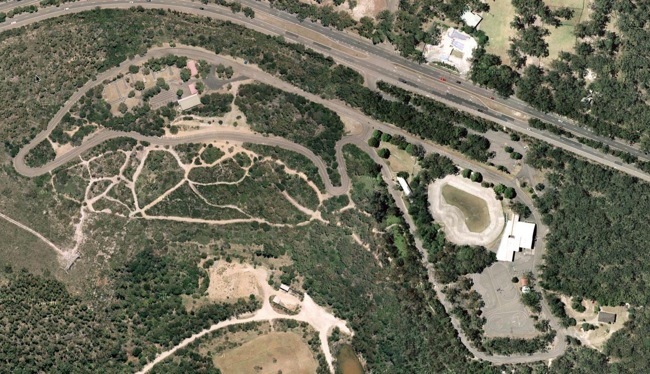 This unique event not only gives you the opportunity to see all the latest scooters being sold in Australia, it also allows you to ride them. All on the same day, all at the one event. The Sydney Scooter Expo is being held across the weekend of the 22nd/23rd of September at the Honda Australia Roadcraft Training facility (HART), St Ives. They'll be displays, a show and shine, scooter games to play and food to eat. All the major Australian importers will be in attendance to showcase the latest and greatest scooters. Brands like Vespa, Aprilia, Honda and Yamaha. See first time releases like TGB's all new Bellavita or get into the touring spirit with Honda's Integra maxi. Sporting brand Aprilia will launch the new SR MAX 300 and Street Cube. 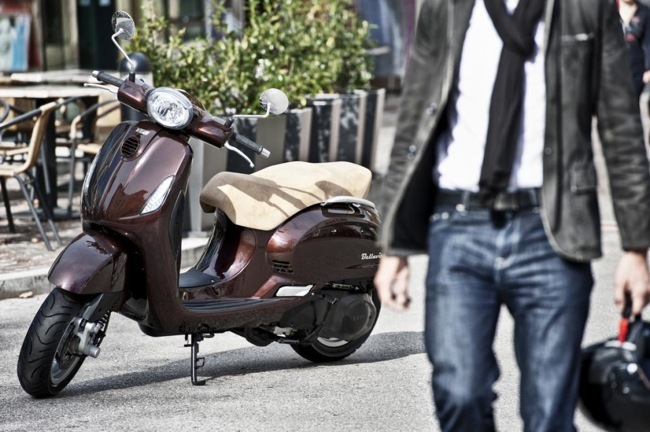 Vespa will showcase its entire range including the king of fashion statements, the GTV 300 "Vie Della Moda". 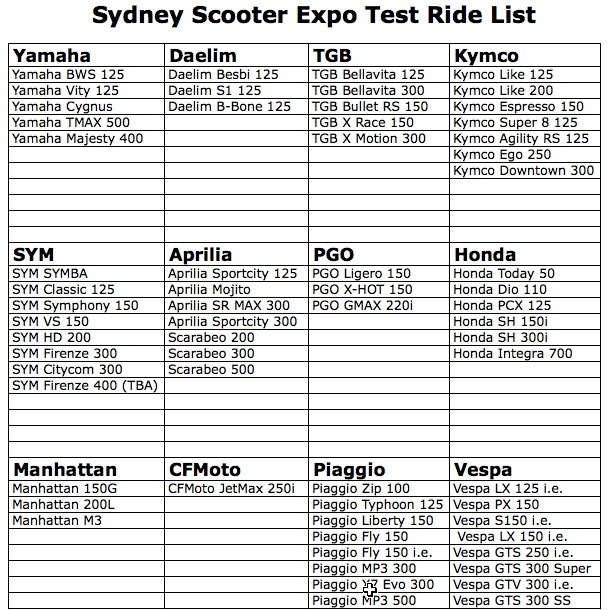 To avoid disappointment on the day, registrations for test rides are now open and available on the Sydney Scooter Expo website. Simply follow the links to register on either the Saturday or Sunday. Or why not do both and spend the whole weekend experiencing the scooter lifestyle. 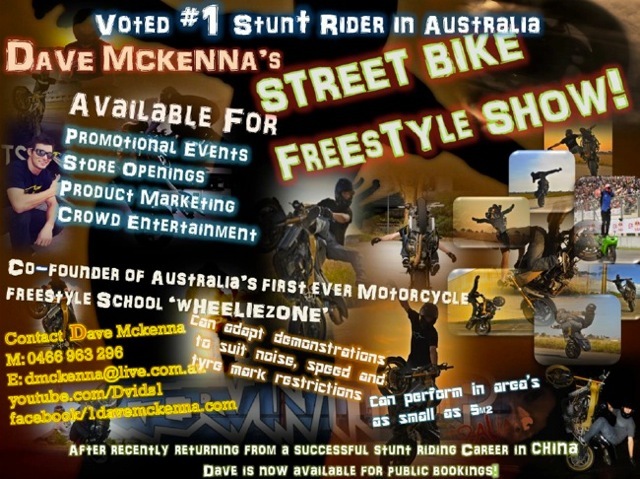 Find out how on www.sydneyscooterexpo.com. Don't miss out on making this summer one to remember. Scooters are not only about saving time and money, scooters are fun. Put a smile on your dial and we'll see you at the 2012 Sydney Scooter Expo. 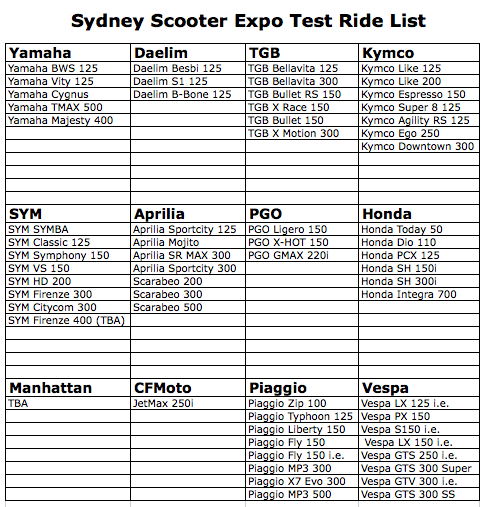 For further updates visit www.sydneyscooterexpo.com. 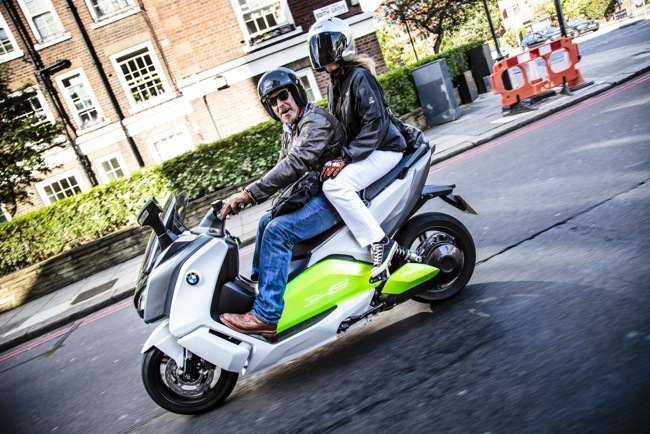 Charley Boorman takes C evolution to the streets of London. The eyes of the world were focused on London for the Olympic Games. 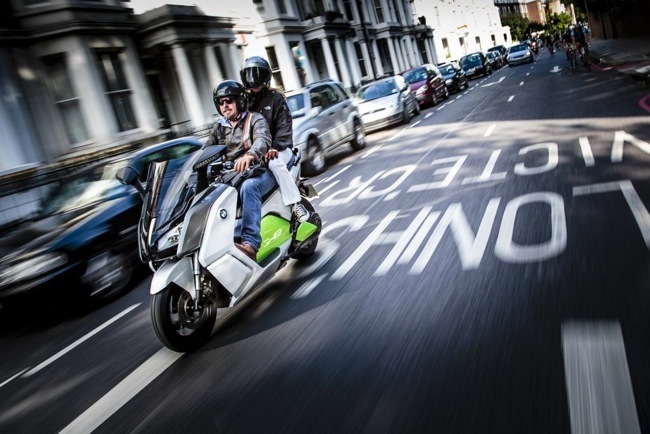 In that great city, BMW Motorrad also had the eyes of the world focused on the future of urban mobility with the revolutionary BMW C evolution electric scooter. London was the ideal choice for the first real world test for the revolutionary scooter. 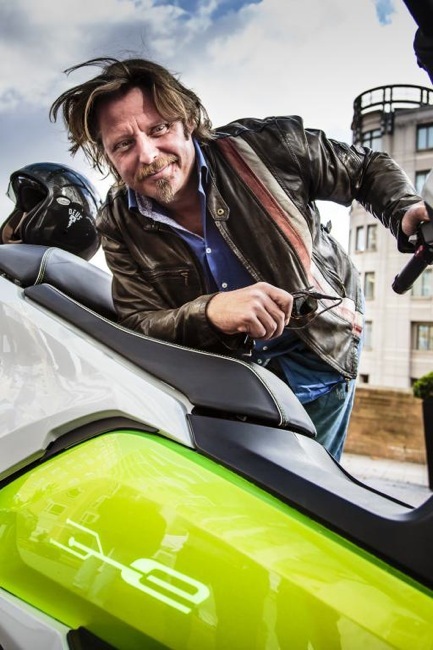 What better test pilot than London resident and BMW Motorrad personality, Charlie Boorman. Charley, along with Ewan McGregor became the public face of BMW Motorrad with the world wide success of The Long Way Around, The Long Way Down and Charley's solo Race to Dakar. Riding their R 1150 GS Adventure and R 1200 GS Adventure Boxers they added to the legend of the GS. Whenever possible Charley climbs aboard his R 1200 GS to get around the crowded capital and he was excited to be able to ride the BMW C evolution in his hometown. "The bizarre thing was that there was no noise," said Charley. "Suddenly you can hear everything in London. Usually, when you're on a scooter or motorcycle, all you hear is the noise of the engine and exhaust, whereas with the C evolution you just cruise through town and it's actually a really pleasant, nice experience as you go along." "You never really know what to expect with an electric bike but one of the big tests is just getting on it and heading through London," said Charley. "I must say that it had a good take-off, it felt instantly quick and stable - and very easy to ride. The handling is great too: it stops well, but if you want to get past a car you squeeze on the throttle and it just shoots past with a beautifully strong power delivery. I'm really, really impressed and I think I should keep one as a 'run-around' in town, to experiment with and show people just how good it is," joked Charley, with a hint of seriousness. "The great thing is that it's got around a 100 kilometre range, so even if you're living outside London, it's the perfect commuting bike for the daily ride in and out of town. If you ever need a bit of extra distance, then you can put a quick 30-minute charge in while you're at work. However, most of us could easily go to work and come back home again on one charge - and that's the future." We had this one in the bag last week. More on the new Vespa GTV 300 in Marrone Etna. Official pictures also. 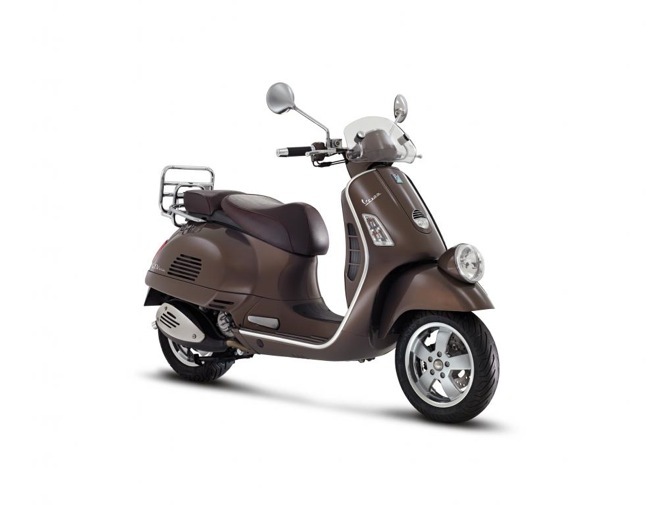 Introducing the new Vespa GTV, "Vie della Moda" the most prestigious vehicle in the range. 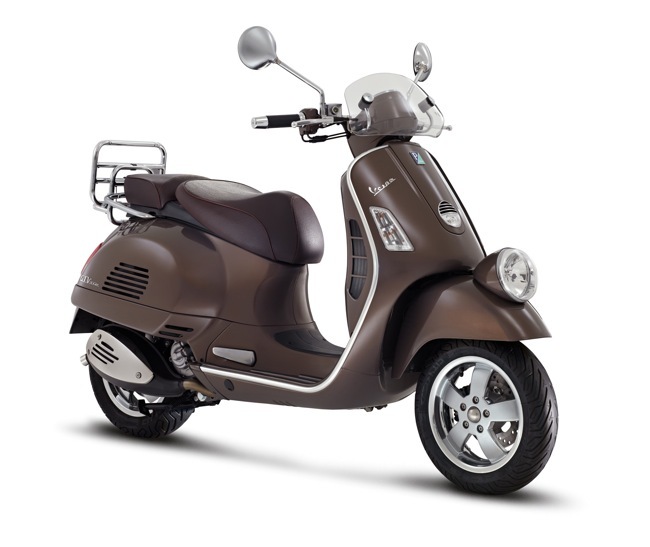 The new model for 2012 is dressed up in the elegant "Marrone Etna" colour which enhances the timeless lines. Vespa GTV "Vie della Moda" stands out for refinement: In its form and function, the new version reinterprets the hallmark elements of 1950's and 60's style. Powered by an ultra-modern and powerful 300cc liquid cooled 4-stroke 4 valve engine with electronic injection and Euro3 compliance - the Vespa GTV "Vie della Moda" offers unrivalled flexibility and responsiveness thanks to the use of fuel injection, which also significantly curbs fuel consumption and both gas and sound emissions. The "Vie della Moda" badge, inspired by the most famous street signs in the world's glamour capital, identifies the most elegant Vespas of all and, emblazoned on the shield back plate, instantly highlights the uniqueness of this alluring model. The headlight mounted on the front mudguard of the GTV is a clear reference to the origins of the Vespa, as are the handlebars, the simple exposed metal tube of the earliest Vespas' that now re-appears on the Vespa GTV "Vie della Moda", and echoes the trend seen in today's motorcycles. The two-seat saddle in eco-leather is elegant and comfortable, and as on the original Vespas', is split into two separate sections, while the precision crafted piping emphasises its silhouette. The particular colouring of the saddle is realised with elegant covering colour-coded with the vehicle in the refined "Marrone Etna", the exclusive colour of the Vespa GTV "Vie della Moda". The chrome finished, five spoke wheels further enhance one of the most elegant Vespas' of all time. The GTV "Vie della Moda" finished in "Marrone Etna" is a special edition and only available in limited numbers whilst stocks last at $9490 + ORC. 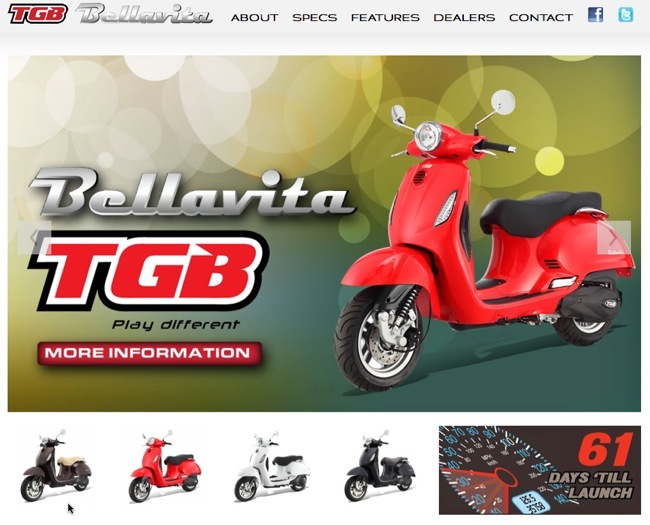 TGB have launched a new microsite to showcase the release of the Bellavita in Australia. Here you'll find a whole host of information including specifications, galleries, colour options and more. The site states 61 days till launch so we now have the official date set. No more guessing! The site can be found @ www.thebellavita.com.au. Don't forget you can take a test ride at the upcoming Sydney Scooter Expo. Revised model or old favourite? New colour schemes for the Sportcity 300. Revised name also, introducing the Street Cube. 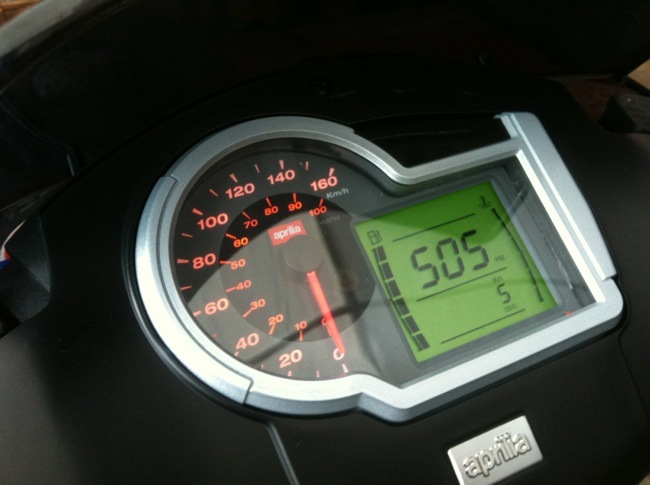 Aprilia has given the Sportcity 300 a fresh lick. New graphics, and two new colour schemes. The Blackline Edition as seen on the 300 Cube was very popular and these colour updates reflect those same styling principles. Actually we see a few parts on the Street Cube that make a welcome return, the analogue/digital dash for example. Regardless, Aprilia know they have a good package with this model. 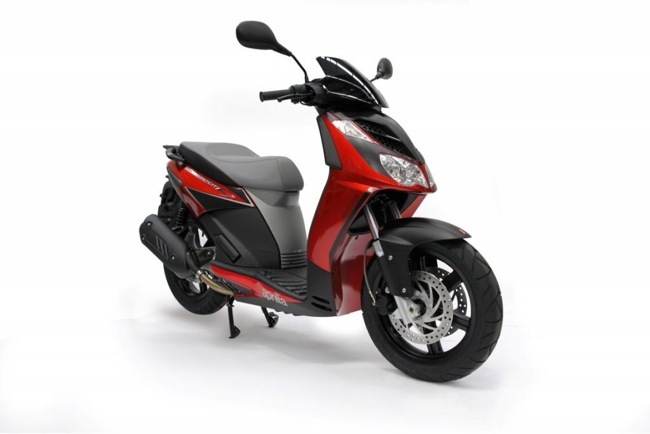 Large 15 inch wheels with good rubber, handy flat floor, twin front disc brakes and a cracking 278 cc engine. The Sportcity 300 has always been a commuters dream and this version continues on down that same path. 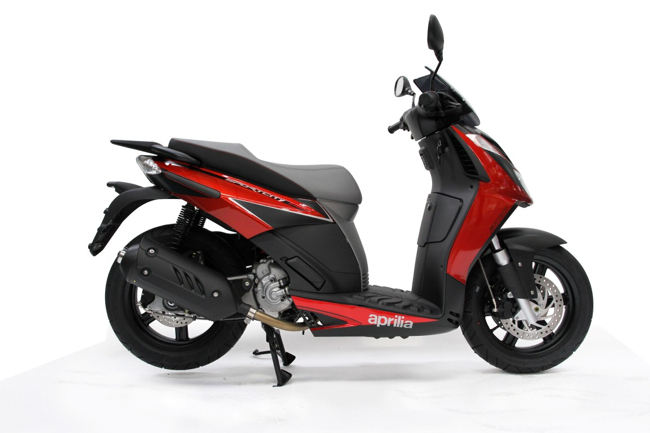 John Sample Automotive, Australian importers of Aprilia scooters, are excited to announce the arrival of the new Sportcity Street Cube 300. 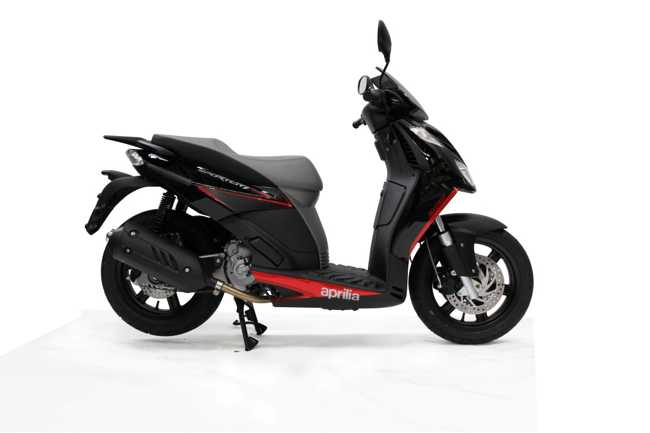 The Aprilia Sportcity revolutionised the way big wheeled scooters were perceived the moment it hit the market. With 15" wheels, powerful engine and an extremely stiff chassis, the Sportcity immediately set itself apart as a scooter that perfectly combines the comfort of a big wheeled scooter with the dynamics of a sports chassis, offering a new concept of urban mobility that is more active and exciting than ever before. These features have earned the Sportcity its remarkable success, making it one of the best‐selling Aprilia models and a major contributor to Aprilia is the fastest growing brand on the Australian market in the over 250cc segment. 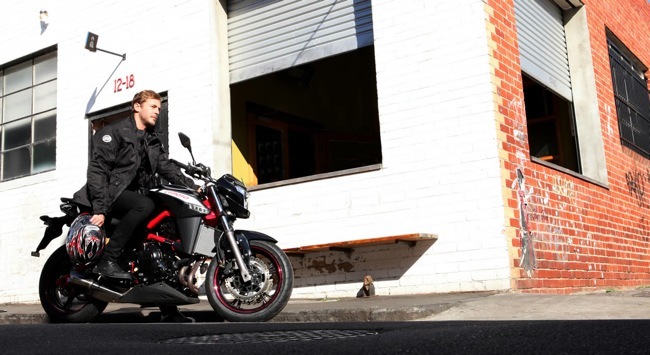 The Sportcity Street Cube is dynamic and practical, is an extension of the popular Sportcity 300 range and will sit alongside the Sport City Cube to complete the 300cc range. The new Sportcity 300 Street Cube features a number of detailed changes over the other Sportcity products including new colours and styling, a higher screen, new switch gear and a refined seat. All other technical features such as engine, transmission and brakes are as on the Sportcity 300 Cube range. 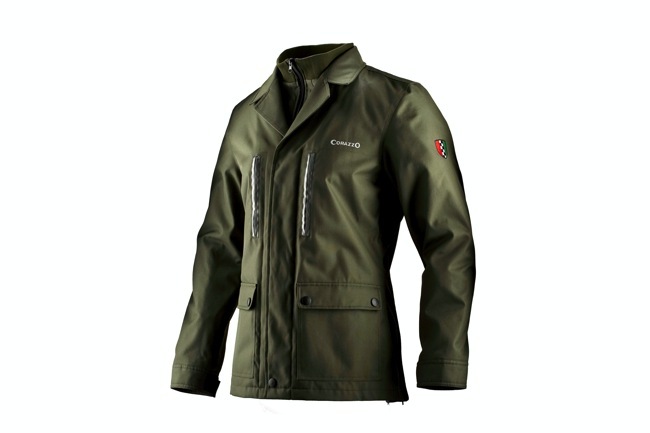 Corazzo Tempeste now available in olive. How tempted are you? A jacket straight out of the high-fashion world has never been so practical, and now Corazzo will tempt you with a new olive green colour. The Tempeste is already known for its all-season sensibilities, including the completely waterproof shell for wet days, the zipper vents for hot days, and the removable fleecy vest for the days you can’t predict. As always, the Tempeste comes equipped with shoulder, elbow, and back armor. The outer shell, although soft to the touch, is abrasion-resistant to protect your skin. The Tempeste’s deep pockets, stylish collar, and new olive colour would even tempt a 007 agent. Doesn’t it tempt you? Visit dealers @ www.corazzo.net.au/dealer-locations. Or www.corazzo.net.au for further details. Our regular market update across the three Mojo brands for July 2012. TGB pushing up with 12% market share in July. According to results just released by ERG International, TGB Scooters was the second highest selling scooter brand in Australia for the month of July, owning 12% of the entire Australian scooter market. Led by some stellar results from the 101S and new Bullet 50 models, TGB continues to buck the market trend and maintain a stable position in the scooter market. “The results for TGB scooters are quite exciting,” said National Sales Manager, Alan Collins. Year to date, TGB scooters have grabbed 8.4% of the national scooter market and currently sit as the fifth largest scooter brand in Australia. TGB scooters range from 50cc commuter scooter to a powerful 300cc maxi scooter, with many models in between. Exciting developments in the TGB range is the upcoming launch of the new retro‐styled Bellavita. 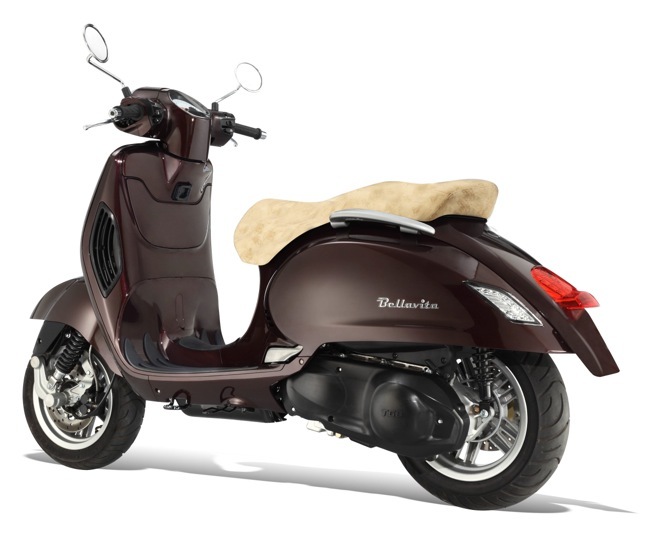 Available in both a fuel injection 125cc and 300cc configuration, the Bellavita oozes class from the inside out. 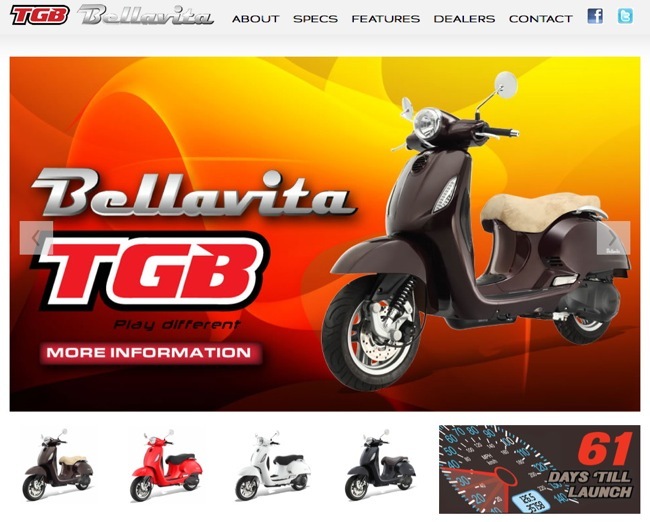 “The Bellavita is a really exciting product to introduce to the TGB range in Australia and we believe that this will help up to increase our market share further, with us now being able to offer that little taste of Europe in a scooter,” Collins says. The TGB Bellavita will be available in late September, 2012. Ideal for inner city travel, the TGB scooters are a lifestyle choice! Supported a 2 Year Factory warranty with easy parking and cheap fill up at the tank, TGB scooters are practical as well as fun and stylish. In Australia, TGB scooters are distributed by Mojo Motorcycles, who were established eight years ago and are the exclusive distributor for CFMoto motorcycles, scooters and ATVs, Daelim motorcycles and scooters, as well as TGB scooters. In July, Mojo Motorcycles held a whopping 5.9% of the entire Australian Motorcycle Market and year to day currently hold 3.5% of the total Australian motorcycle market, according to results just released by ERG International. Mojo Motorcycles pride themselves on importing quality products to the Australian market. If you LOVE TGB Scooters, you should LIKE the newly launched TGB Scooters Facebook page. TGB Scooters Facebook keeps members up to date on all things TGB!!! Daelim was relaunched in Australia early last year, and since then has built their way up in the market place enticing more and more customers Australia wide. Supported by an extensive nationwide dealer network the Daelim brand has become famed for their well thought out, modern designs complemented by high quality build and modern technology. Founded in 1978, Daelim Motors was an already established global leader within the motorcycle industry and now since its introduction in to Australia is beginning to mirror their market leader instincts! On a whole in Australia, according to the latest results released by motorcycle industry data specialist, ERG International, the Daelim brand has grown 250.5% in comparison to the same time last year. According to ERG, in July Daelim scooters held 5.2% of the national scooter market. As reported also, Daelim scooters recorded an incomprehensible 644.4% growth in sales in comparison to the same time last year. Daelim scooters are all powered by a 125cc, each with their own stylish benefits. The most popular of the Daelim scooter range is without doubt the Besbi! This scooter has become one of the highest selling scooters in the Australia, and definitely the best seller for Daelim. The Besbi offers classical European styling, with power and versatility ideal for metro living! The Daelim range also features a 250cc motorcycle, the VJF250. This product alone has increased sales by 56.2% in comparison with retail results for the same time last year. “Daelim’s growth in the market place since the relaunch in 2011 is most definitely significant and at present we do have some gaps in our product range which we are working to address at this moment,” says National Sales Manager, Alan Collins. 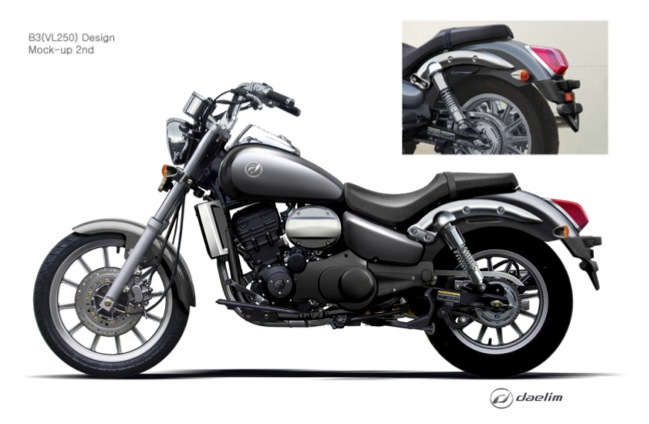 As mentioned, the new‐model cruiser motorcycle will be called the VL250, powered by a liquid cooled 250cc engine with plenty of grunt and power for cruising down the highway. “The Daelim range is and will continue to be a true reflection of what the Australian community demands‐ easy to operate, fashionable, nimble commuters ideal for city travelling,” Collins says. In Australia, Daelim are distributed by Mojo Motorcycles, who were established eight years ago and are the exclusive distributor for CFMoto motorcycles, scooters and ATVs, TGB scooters, as well as Daelim motorcycles and scooters. In July, Mojo Motorcycles held a whopping 5.9% of the entire Australian Motorcycle Market and year to day currently hold 3.5% of the total Australian motorcycle market, according to results just released by ERG International. With Australians struck by Olympic fever, CFMoto grabbed the Australian motorcycle market by the horns in July and recorded a gold medal performance by posting its best result to date. The CFMoto brand as a whole held 3.9% of the entire Australian motorcycle market! 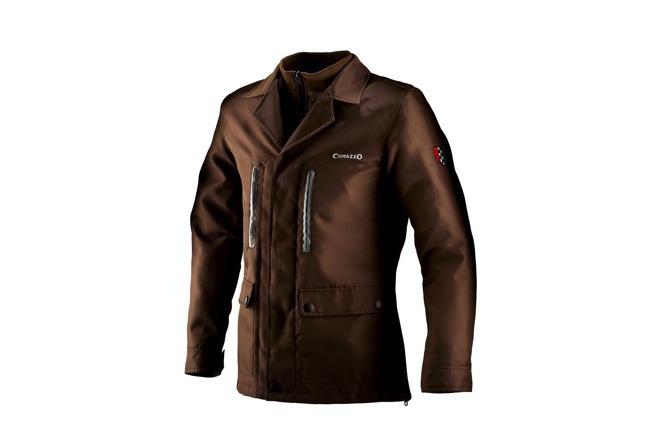 According to results released by ERG International, the CFMoto brand is celebrating a 115% increase in sales so far in 2012 against the same period last year. “Our result in July saw CFMoto as the fourth largest ATV brand and the six largest motorcycle brand in Australia. It also places CFMoto in the Top 10 motorcycle brands year‐to‐date,” said National Sales Manager, Alan Collins. CFMoto ATVs were definitely a success story in their own right last month, grabbing 12.5% of the entire ATV market in Australia. “It has been a consistent rise with CFMoto ATVs, with solid growth posted month‐in and month‐out, with the July result no doubt a highlight so far,” Collins said. During the month of July, customers who purchased a CFMoto ATV received a free Start Up Kit which included practical items such as brake pads, uni filters, wet weather riding gear and much more. Valued at $599, the Start Up Kit Promotion has now been extended until the end of August. All CFMoto ATVs come fully equipped with automatic CVT (continuous variable transmission) and selectable 2WD/4WD modes with a low / high range and independent rear suspension and much, much more. Ranging from 500cc‐800cc capacity, the CFMoto range is made for hard work. In addition to the cracking ATV results, CFMoto motorcycles took leaps and bounds in the market place. With the launch of the highly anticipated CFMoto V‐Night and 650NK road bikes in the month of July, CFMoto owned 2% of the entire road motorcycle market. This is a growth in sales of 73.8% on this time last year. 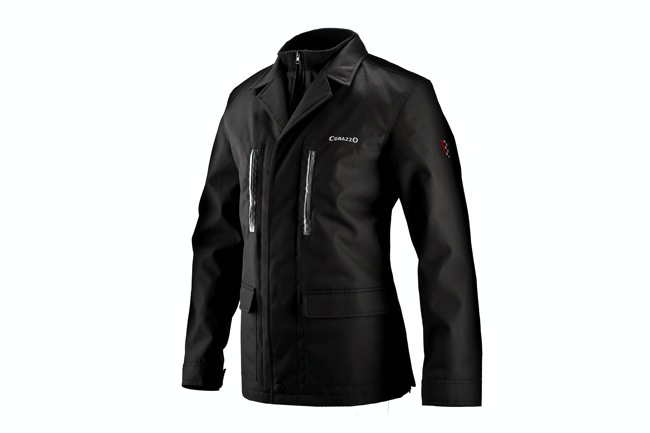 It is without doubt that CFMoto is becoming one of the most talked about brands of 2012. Manufactured in Hangzhou, China, CFMoto manufactures over 600,000 vehicles to a growing global dealer network. “The CFMoto difference is that is has a clear vision of becoming the world’s leading supplier of powersports products through constant product innovation and development,” Collins says. 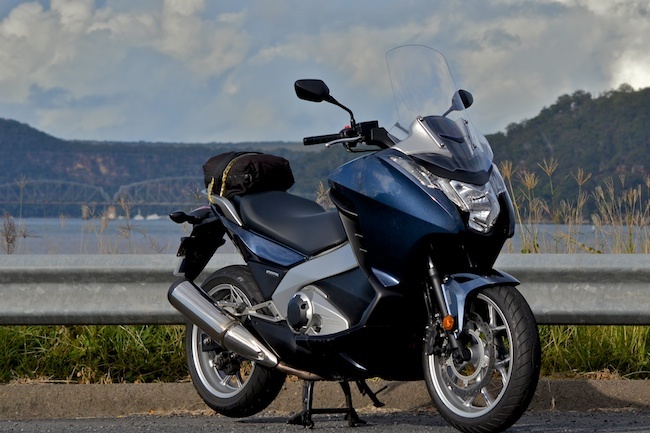 In Australia, CFMoto are distributed by Mojo Motorcycles, who were established eight years ago and are the exclusive distributor for Daelim motorcycles, and scooters, TGB scooters, as well as CFMoto motorcycles, scooters and ATVs. In July, Mojo Motorcycles held a whopping 5.9% of the entire Australian Motorcycle Market and year to day currently hold 3.5% of the total Australian motorcycle market, according to results just released by ERG International. It'll only be a matter of time before your iPhone can be plugged into any number of models and brands. This is the first real attempt Ive seen where any individual can acquire information like this to such a degree. This is normally left for the technical experts in the workshop. 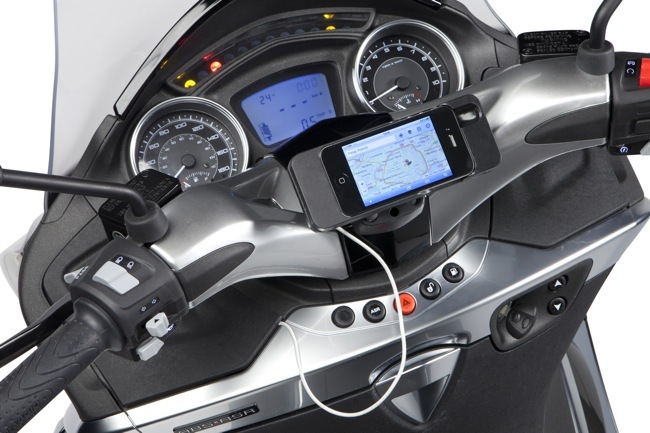 Piaggio's Multimedia Platform(PMP) needs to be installed on the X10. The app provides information via regular 3 or 4G networks. It can be used for navigation, trip information, error checks and user manuals. Wireless headsets can be used in conjunction. You download the free app from Apples "app" store. It all points to a very bright future in this area. We scooter riders like staying connected, we like our gadgets too. Items like this can be very compelling when making a scooter purchase. My prediction is we'll find something like Piaggio's Multimedia Platform on a host premium models from each manufacturer in the near future. Built into the scooter and standard equipment. In the interim, take a look at Piaggio's Multimedia Platform in great detail. The innovative multimedia platform PMP makes its debut on X10, the new Piaggio maxiscooter and already a benchmark in the comfort, performance and safety category. 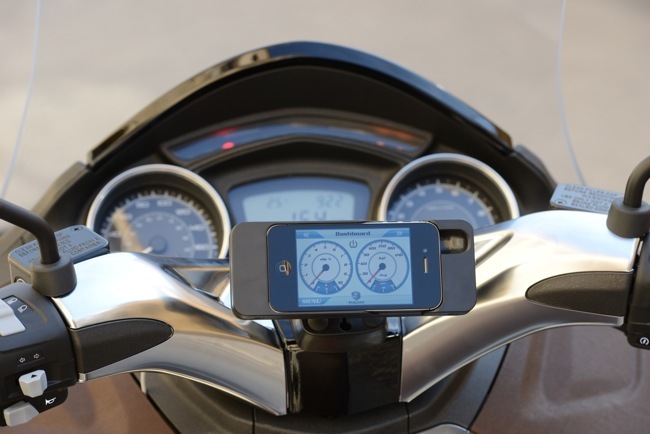 It is designed and made by Re:Lab for Piaggio, connecting X10 to iPhone, making the latter a true and proper sophisticated multifunctional on-board computer. Once again Piaggio opens a window on the future, casting the foundations for a new way of approaching communication on two wheels, with interesting possibilities for development and applications that will also be extended to other Piaggio Group vehicles. 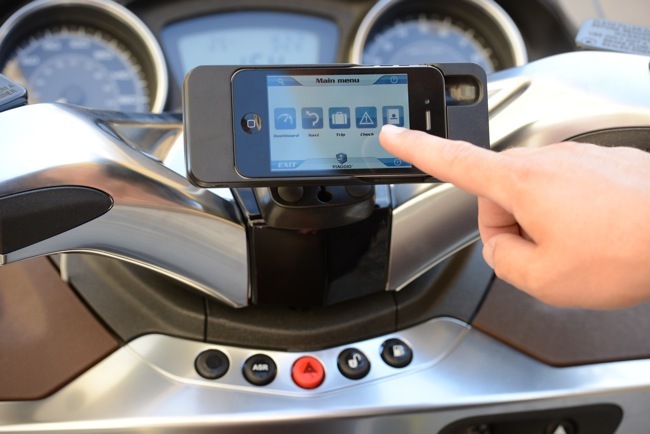 The wireless X10 connection allows you to simultaneously see on the iPhone screen, important information about the vehicle so you will always have the journey parameters under control. The iPhone's touch screen displays in all simplicity the various options as preferred. Speedometer, rpm indicator but also the instantly supplied engine power and torque, longitudinal acceleration, instant and average fuel consumption, average speed and battery voltage - these are but a few of the functions available. And that's not all. 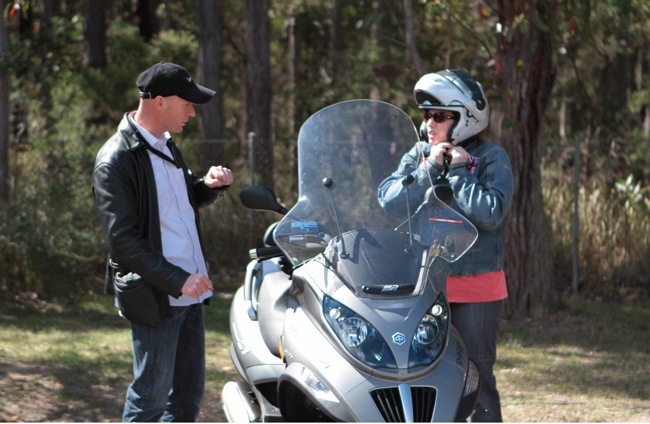 Thanks to the PMP technology it is now possible to increase rider and passenger safety. The tyre status control function (only available for the ABS/ASR versions) synergically exploits the vehicle's sensors and the iPhone to monitor wear and inflation of the tyres, warning the user immediately before any potentially critical situations can arise; the general analysis function allows you to check vehicle status, explaining - in the case of an anomaly - what to do and indicating the nearest authorised dealer you can go to. Again on the subject of safety, the interaction functions are disabled when riding and the last screen page selected before starting out remains set. Piaggio PMP also boasts a series of contents that are meant to enhance the riding comfort of X10. If fuel is low, the system automatically tells you which petrol stations are closest and sets the route to follow directly on the navigation app pre-installed on the iPhone. The PMP automatically stores the last position of the vehicle before the engine is switched off, making it easier to find if you forget where you parked it: this is a very useful function if, for instance, you are in a city you are unfamiliar with. It is also possible to store all the journey data so as to analyse, in a simple way, your riding style thanks to a host of parameters acquired by the app in real time. It is of course possible to browse the user and maintenance manual of your vehicle on the iPhone. 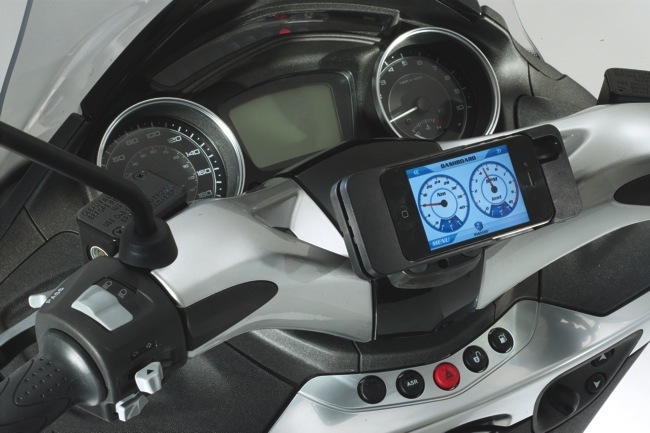 The kit, part of a comprehensive range of accessories available for all three engine capacities of the X10 - 125, 350 and 500 cc - includes the wiring and the communication unit between the iPhone and the vehicle. The applications and their updates can be downloaded free of charge from the Apple Store. Your chance to experience the scooter lifestyle. 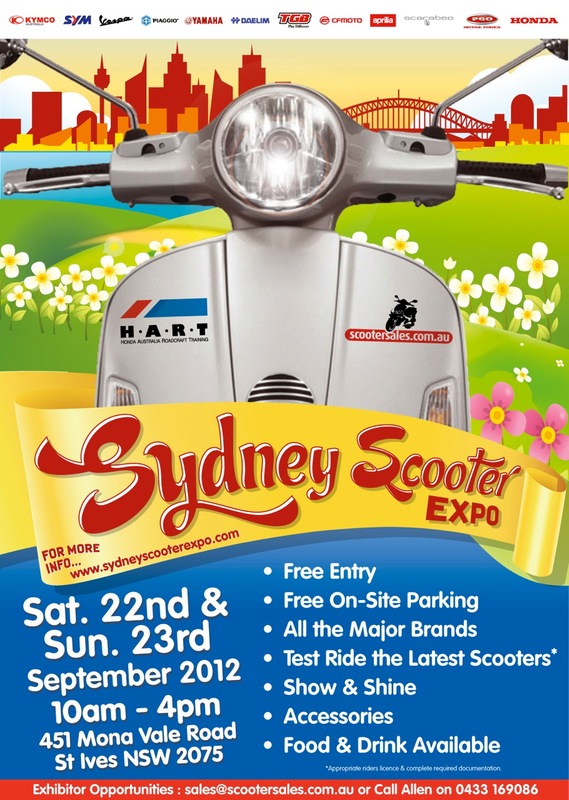 Registration now open for the 2012 Sydney Scooter Expo. Scooterists from all over Australia will be converging on St Ives this September for the 2nd Annual Sydney Scooter Expo. The 22nd/23rd of September will mark the largest gathering of scooter enthusiasts ever in one location. A weekend expo that features all the top manufactures. The expo, like last year, is all about seeing the latest scooters on display. After this, it becomes about the test rides. Riding around the HART facility on your shortlist of favourites. This years expo will feature over 65 demonstrators from all the leading brands. Registration for the event is now open and by registering you ensure you get to ride want you want on the day. To register simply visit www.sydneyscooterexpo.com. The 2012 Expo will also feature many Australian firsts. TGB's Bellavita 300 will be the first large capacity Taiwanese classic to ever hit Australia. The first time many will have seen Aprilia's new SR MAX 300 in the flesh, let alone ridden one. Australia's top selling scooter the Piaggio Fly gets a complete revamp for 2012/13, this will also be an Australian first. Maxi scooters will feature at the Sydney Scooter Expo. 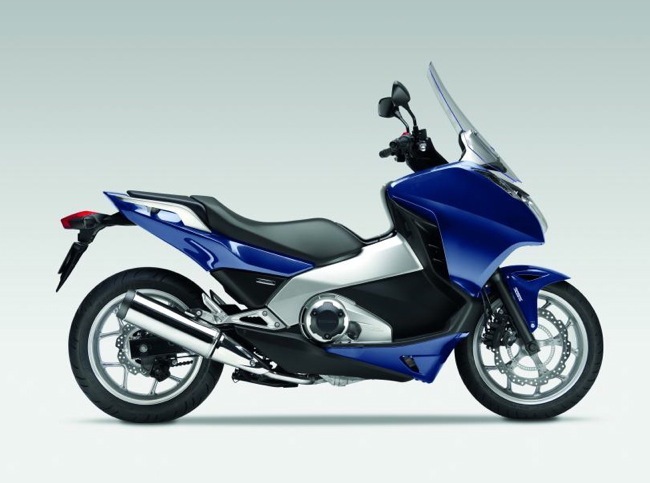 Honda will be demonstrating the all new Integra 700i. Yamaha will feature the TMAX 500, which was an absolute hit at last years event. 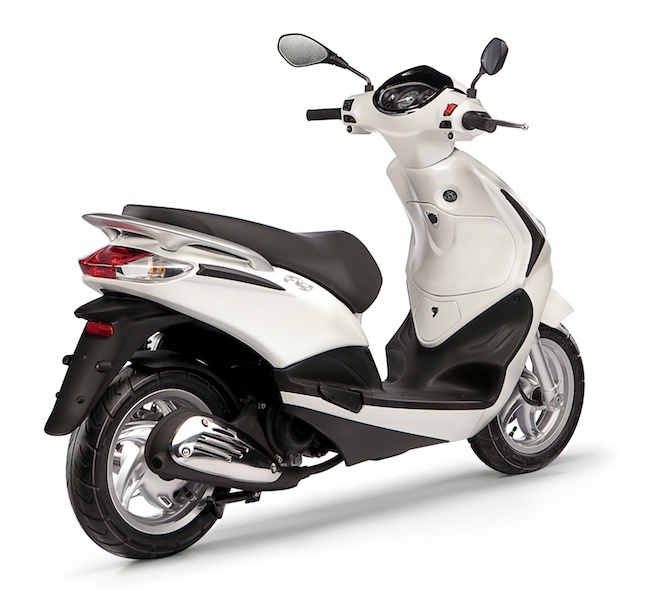 Or for 3-wheels why not get a taste of Piaggio's MP3 range. The Sydney Scooter Expo is unique. 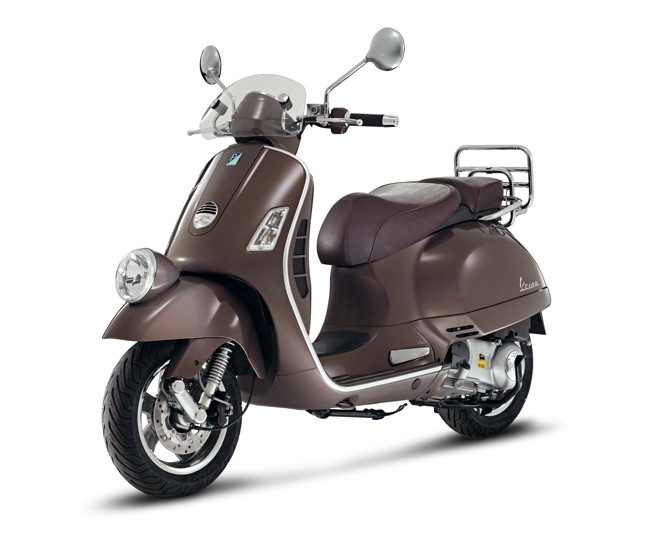 Where else could you ride the full line-up of Vespa scooters including "Her Majesty" the GTV 300 Della Moda. Every leading manufacturer in Australia will be there. The Expo is your chance to experience scooter lifestyle first hand. The Sydney Scooter Expo will also feature fun ride events, accessory displays, tips about insurance and licensing. For everything scooters come join us at the 2nd annual Sydney Scooter Expo. "See you at the Expo".